Birmingham (pop. 992,000, metropolitan area 2,575,000) is the second largest city in England after London and one of the most ethnically diverse. Over one fourth of the population is non-white, including 19.5% of South Asians and 6.1% of Afro-Caribbeans. Although often referred to as an architectural nightmare, there are plenty of reasons to visit the city, such as its fashionable shopping centres and department stores, pub-lined canals, ethnic restaurants, art galleries, diversified music scenes and excellent nightlife. 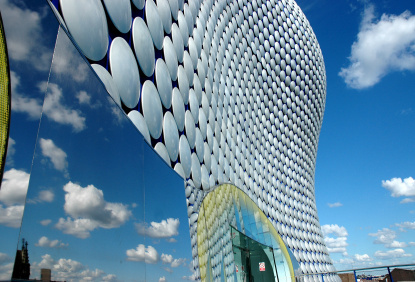 The symbol of Birmingham's recent transformation is incarnated by the ultra-modern Selfridges department store at the Bullring Shopping Centre. Brum or Brummagem, as the local call their city, has produced an amazing number of pop and rock bands and singers. Among the most famous Brummie bands are Black Sabbath, Led Zeppelin in the 1960's, or Duran Duran in the 80's. 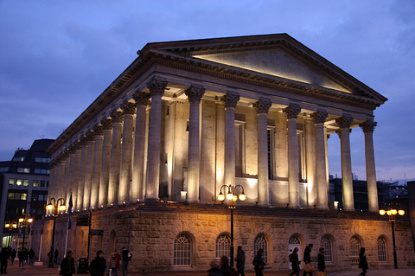 On the classical scene, Birmingham's Symphony Hall is home to the internationally-renowned City of Birmingham Symphony Orchestra. J. R. R. Tolkien, the author of Lord of the Rings, attended the very reputable King Edward's School in Birmingham. Another illustrious local is John Cadbury (1801-1889), the proprietor of a small chocolate business, which later became the world's largest chocolate producers that still bears his name. Birmingham had a slow start. Settled since the Bronze Age, it was the location of a Roman fort soon after 43 AD, but remained a tiny farming village until 1154, when a market place was first established. The wool and leather industry developed in the 13th century, and metalworking in the 16th century. By the mid-17th century, Birmingham was a small town of around 5,500 inhabitants, renowed for guns and swords manufacturing. 15,000 swords are said to have been produced in Birmingham for Oliver Cromwell's forces. The city rose to prominence at the very beginning of the Industrial Revolution in the mid 18th century, and its population increased steadily to 24,000 in 1750, 74,000 in 1800 and 130,000 in 1830. Birmingham was home to the Lunar Society, a discussion club made up of a number of prominent industrialists and scientists, such as James Watt (1736-1819) and Matthew Boulton (1728-1809), the two pioneers of the steam engine; William Murdock (1754-1839) the pioneer of gas lighting; Joseph Priestley (1733-1804) a chemist and dissenting clergyman whose support for the French Revolution caused the Priestly Riots; or Josiah Wedgwood (1730-1795), who is credited with the industrialisation of the manufacture of pottery. 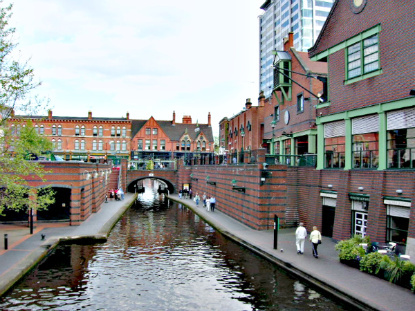 Birmingham's geographical location, close to the coalfields of northern Warwickshire and Staffordshire, and at the centre of England's canal system, played a decisive role in its fast development. With the coming of the railway in 1837, and Birmingham set as the major hub for the Midlands, the city boomed, and soon became known as the "City of a thousand trades" or "Workshop of the World", for the wide variety of goods manufactured there - buttons, pins, cutlery, nails and screws, guns, tools, jewellery, toys, locks, ornaments and later motorcars. 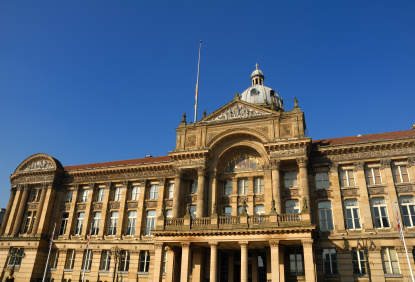 At the dawn of the 20th century, Birmingham's population had reached 630,000. The neighbouring towns of Aston, Edgbaston, Erdington, Handsworth, King's Norton, Northfield and Yardley were eaten up between 1889 and 1911. The city boundaries were further expanded to include Perry Barr (1928), Castle Bromwich (1931) and Sutton Coldfield (1974). During the First and Second World Wars Birmingham's car factories manufactured all that was required for warfare, from ammunition and steel helmets to warplanes and tank parts. That earned the city to be heavily bombed by the Luftwaffe. Postwar reconstruction left deep scars into the already dull landscape of the industrial metropolis. Birmingham acquired the reputation of being the ugliest city in England, though recent redevelopments have noticeably improved the aesthetic in some areas of the city. 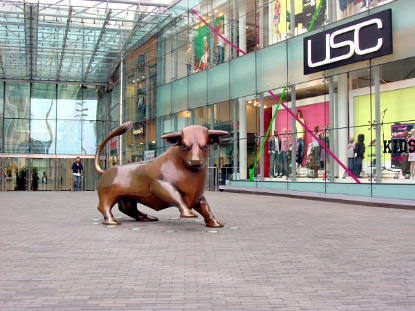 Many of Birmingham's sights are concentrated in the contiguous area stretching from Victoria Square to the Canalside Development, passing by Chamberlain Square and Centenary Square. The other attractions are dispersed around the rest of the city and suburbs. The main buildings here are the grand Council House, the neo-classical Town Hall (designed on the Temple of Castor and Pollux in Rome) and the Central Library. North of Chamberlain Square is the celebrated Birmingham Museum and Art Gallery, opened in 1885, and claiming first-class works by the Pre-Raphaelite Brotherhood, as well as paintings by Degas, Renoir, Braque and various other displays related to natural history, ethnology and archeology. Crossing Paradise Circus, we reach Centenary Square, with the massive Hall of Memory War Memorial and communist-style Forward Monument along Broad Street, and the Repertory Theatre, International Convention Centre and Symphony Hall closing off the square. A bit further comes one of the city's most pleasant area, the canalside development. The prestigious Brindley Place, was created in the 1990's and is famous for its stylish and high-quality restaurants, cafés, bars and shops. The Brindley complex includes the much acclaimed Ikon Gallery (admission free) is a charity that aims at educating audiences and promoting artists. Its often displays controversial contemporary sculpture, photography, paintings as well as media. Still around Brindley, the National Sealife Centre boasts a one million litre ocean tank and is renowed for its giant sea turtles, sharks, sting rays, tropical reef fish, seahorses, crabs and lobsters. 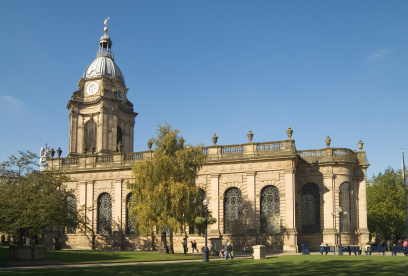 Birmingham is home to England's smallest cathedral, the neoclassical St Philips, constructed between 1709 and 1715. The stained-glass windows are by Pre-Raphaelite Edward Burne-Jones. Millenium Point, 1km east of St Philips, is the city's futuristic sector and is part of Aston University. The main attractions here are the Thinktank, dubbed 'Birmingham Museum of Science and Discovery', and the giant-screen Imax Cinema. About 1km north of Centenary Square, the Jewellery Quarter is the largest concentration of dedicated jewellers in Europe.There are hundreds of showrooms and outlets. Even if you are not planning to buy anything, you could have a look at the Museum of the Jewellery Quarter, housed in the old workshops of Smith & Pepper, which explores the history of the city's jewellery manufacturing since the 18th century. Next the the Jewellery Quarter is the former residence of Matthew Boulton, Soho House. A few kilometres south of the centre, the Barber Institute of Fine Arts (admission free) was built on the premises of the campus of the University of Birmingham. It has a stunning array of illustrious painters, such as Rubens, Van Dyck, Rembrandt, Gainsborough,Turner, Delacroix, Manet, Degas, Monet, van Gogh, Rodin, Gauguin, Picasso, Matisse or Magritte. It also hosts classical music concerts and a collection of 15,000 coins, including one of Europe's finest collections of Byzantine coins. Dedicated to the world-famous chocolate, Cadbury World will reveal you all the secrets of the addictive substance. It is located in the suburb of Bournville Village, which also includes 18th-century Selly House (open all-year-round Tue-Fri 10am to 5pm, and also Sat-Sun 2-5pm between April and Sept.; entry £2) and its Tudor garden, which was acquired by the Cadbury family. Birmingham is the main hub of the Midlands and has trains and buses to about any places in the region. The city sits at the junction of the M40 (to Oxford and London), M5 (to Bristol and Plymouth), M6 (to Stoke-on-Trent and Lancaster) and A14 (to Coventry and Cambridge) motorways. Trains link Birmingham to London Euston or Marylebone (1h45min to 2h10min, £24.90), Coventry (20 to 35min, £3.30), Warwick (30min, £4.40), Stratford-upon-Avon (50min, £5.20), Worcester (40 to 55min, £5.30), Shrewsbury (50min to 1h, £9.40), Gloucester (50min, £11), Oxford (1h10min, £19), Bristol (1h30min, £28), Derby (1h20min to 1h50min, £8.90), Manchester (1h30min to 1h45min, £21). and Leeds (2h50min, £31.50). National Express has buses to London (2h50min, £13), Worcester (35 to 40min, £3.50), Coventry (35 to 45min, £2.75), Leicester (1h to 1h30min, £5.75), Shrewsbury (1h15min, £4.75), Oxford (1h30min to 2h10min, £9.50), Bristol (2h to 2h20min, £15.50), Leeds (3h to 4h30min, £20), Manchester (1h40min to 2h50min, £10.25) and Birmingham International Airport has flights to and from the main cities in Scotland, Ireland, Western and Northern Europe, New York and even to Pakistan (Islamabad, Tashkent...).